The world famous “Share a Coke” campaign has hit Singapore’s shores. For the first time in Singapore, Coca-Cola cans and bottles will feature nicknames and phrases in place of the iconic Coca-Cola logo. In celebration of Singapore’s 50th anniversary, from now until end of august, Coke, Coke Zero and Coke Light cans and bottles will feature commonly-used Singaporean terms such as Auntie, Uncle, Ah Boy and Chiongster. It will also have favourite Singlish phrases such as Gam Siah, Relak Lah and Chiong Ah amongst other more commonly used colloquial terms. Coca-Cola is also inviting people to share their “Share a Coke” stories, photos and videos on social media using the hashtag #ShareaCokeSG and #SG50. Coke fans can create customised Coca-Cola cans at “Share a Coke” roadshows that will take place across the nation over the next few month. For every SG$10 spent on Coca-Cola trademark products, the public can present their proof of purchase at a “Share a Coke” roadshow and receive their own personalised can. The first roadshow will kick off on the 26 April. Gill McLaren, general manager of Coca-Cola Singapore said that SG50 is a milestone year for Singapore and Coca-Cola wanted to create something special that celebrates Singapore’s unique identity and heritage while strengthening the bonds with the nation. “We are excited to see how people in Singapore will use the cans and bottles to create special moments and memories with people that matter most to them. There’s something quite special about receiving a Coca-Cola can with your name on it and we wanted to ensure that everyone in Singapore – no matter how unique their name- has the opportunity to create their own ‘Share a Coke’ can,” said McLaren. Meanwhile, Kannie Yeo, president of the Coca-Cola Collectors Club in Singapore added that it is not very often a well known brand swaps its logo for a person’s name. 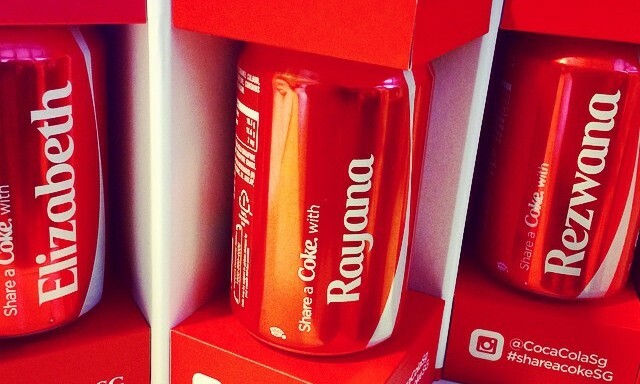 Since it was first launched in Australia in 2011, the “Share a coke” campaign has made its rounds in 80 counties with more that 400 million personalised cans and bottles. Meanwhile, the non-profit media association is in search of Slaughter's successor. .. If you haven't seen (or participated in) the ALS Ice Bucket Challenge this week, you should reconsider your role in the marketing ..